Mark Gray, DDS at Cosmetic and Family Dentistry, lets you erase tooth loss to give you a smile you’ll love with dental implants in Houston. Whether you need a full mouth restoration or partial implants in Houston, Dr. Gray will give you the fresh start you’ve been looking for. Dental implant surgery is a fairly invasive procedure that allows you to rebuild your smile using artificial teeth. Using a titanium implant inserted under the gum, artificial teeth are placed into the implant to mimic your natural teeth. 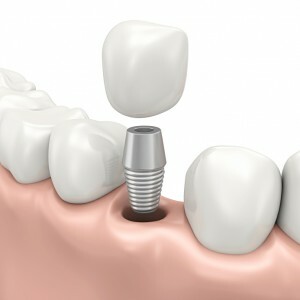 Dental implants are the next best thing to your own teeth because they are a permanent solution for tooth loss. While dental implants are nearly 98 percent effective, the level of success you receive depends on the dental implant surgeon you choose. You need an implant specialist who focuses his care on dental implants. Although implants are considered to be safe, there is the risk for infection, injury to surrounding tissue, sinus problems, and nerve damage; however, all of these risks are greatly reduced when choosing a professional implant dentist to handle the procedure. The most important aspect of choosing a good dentist to handle your procedure is finding one who specializes in dental implants, like a cosmetic dentist. The dentist you choose must be able to handle all aspects of the procedure from start to finish, including the abutments and crowns. By choosing one who specializes in the area, they’ll be specially trained and certified to perform the entire procedure safely and effectively. The key to finding a good dentist not only relies on their credentials, but their reputation as well. Ask friends or family members for recommendations, or even your family doctor, to be pointed in the right direction. Then, you’ll need to do your research. Look for dentists who are associated with state and local dental associations. Once you have a list, check their reviews and begin making calls to help determine which will be the best choice. How long have they been practicing? Have they undergone additional training? How experienced are they with the procedure? What treatment options do they offer? Do they offer pain-free dentistry or other advancements in dentistry? What types of anesthesia are used? Do they take my insurance or offer payment plans? Dr. Mark Gray is the go-to dentist for dental implants in Houston. A graduate of the University of Texas Dental School and a mentor at cerecdoctors.com, he holds expertise as a cosmetic and family dentist to perform implant procedures. In addition, he is a graduate of the Hornbrook Group—Advanced Education in Aesthetic and Restorative Dentistry and a member of the American Dental Association. With Dr. Gray, you’re in good hands with a dentist who is not only certified and knowledgeable, but compassionate and caring to handle your dental implant needs. Dr. Gary is the 77077 dentist you need to rest easy with dental implants.